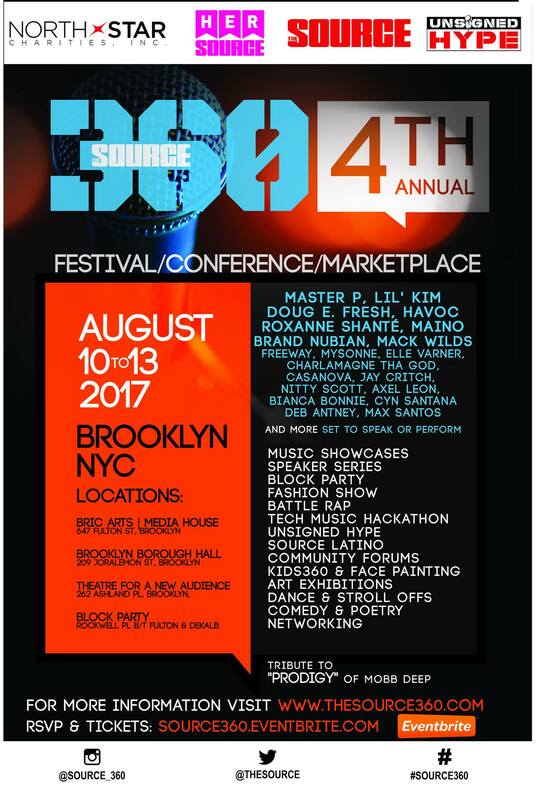 New York, NY – August 3, 2017 – Free registration now open for the incredible fourth annual SOURCE360 Festival and Conference, presented by NorthStar Charities and The Source Magazine. Set for Thursday, August 10th through Sunday, August 13th in the exciting cultural center of downtown Brooklyn, SOURCE360 offers a full spectrum of activations designed to engage and educate the community with the latest in arts & culture, music, film & television, fashion, sports, business, and digital technology. Venues include prominent cultural institutions such as BRIC Arts|Media House, Brooklyn Borough Hall, Polonsky Shakespeare Center and more! SOURCE360 celebrates the innovation and creativity inspired by Hip-Hop and represents Brooklyn’s diverse cultural tapestry. SOURCE360 is more than a festival and hub of creative performances. Education and thought leadership is essential to the mission, with a schedule of SOURCE360 Speaker Series panel discussions conducted by influencers and entrepreneurs in arts and culture, music, film and television, media, technology, sports and fashion. A panel discussing music biz technology will be moderated by Lisa Evers (FOX and Street Soldiers) and will include Kedar Frederic (TuneCore), Corey Llewellyn (Digiwaxx), Yomi Desalu (BET), Wendy Washington (This Is Dope!) and Valeisha Butterfield-Jones (Google); the session addressing innovative solutions to increase trust between the community and the police features Brooklyn D.A. Eric Gonzalez, Brooklyn NAACP President L. Joy Williams, NYPD Brooklyn North Chief Jeffrey Maddrey, New York City Councilmen Antonio Reynoso and Jumaane Williams, and Dana Rachlin of NYC Together. A panel on opportunities and regulations related to the cannabis business will feature Freeway, Gia Morón (Women Grow), April Walker (Walker Wear), Rani Soto (I Deserve Canna), Kassandra Frederique (New York State Drug Policy Alliance) and Super Bowl champion and former New York Jet Marvin Washington. The contemporary beauty and fashion industry will be discussed by Kahh Spence (celebrity hairstylist), Monica Veloz (beauty blogger), Destiny Moore (Moore by Destiny Moore), Marshalle Crockett (makeup artist), and Andrea Fairweather (celebrity makeup artist); while the current film, TV, and webcasting business will be explored by Benny Boom (director, All Eyez On Me), Rahman Dukes (Revolt), Thembisa Mshaka (writer/film producer), Dorian Missick (actor), and Eden DuncanSmith (youth actor). A panel titled “Bridging The Gap Of Hispanic & Urban Culture” will feature Danny Hastings (Atomicus Films), L Boogs (DJ, Power 105.1/Sirius Shade 45), Cyn Santana (Love & Hip-Hop), Max Santos (musician), and SP The Producer (musician); and the State of Hip-Hop will be examined by a panel including Charlamagne Tha God (radio and television personality), Deb Antney (manager and radio personality), Lord Jamar (Brand Nubian). More panelists and noted session moderators will be announced. Attendees will have the opportunity to build their professional network, enjoy the creativity of Hip-Hop, and gain new insights. Another highlight of the event will be the SOURCE360 Master Class Power Talks, one-on-one interview sessions with influential and inspiring industry leaders. Debra Lee, CEO of BET, will speak on “The Power of Evolution of Cultures, Content and Commerce,” and Master P, CEO of No Limit, will share his journey and thoughts related to “The Power of Hip-Hop and Business.” Surprise music performances will take place between these exclusive conversations at the Polonsky Shakespeare Center in New York. More Power Panels will be announced. To showcase Hip-Hop’s up-and-coming talent, SOURCE360 will also host The Unsigned Hype Showcase and Mic Check All-Stars, which allows up-and-coming artists to battle it out live on stage. Mic Check will feature performances by the next generation of Hip-Hop leaders, including Casanova, Jay Critch and Quadir Lateef. We also have our famed Unsigned Hype competition. Those who will showcase their burgeoning talents include Axel Leon, Chris Rivers, Shotgun Suge, HMF: Baby Homie + Young SAV, Monolo Rose and Choppa Zoe. This exciting display of raw Hip-Hop talent takes place at the BRIC Arts|Media House on Friday, August 11th. Tickets are available here.